Mega Sale! 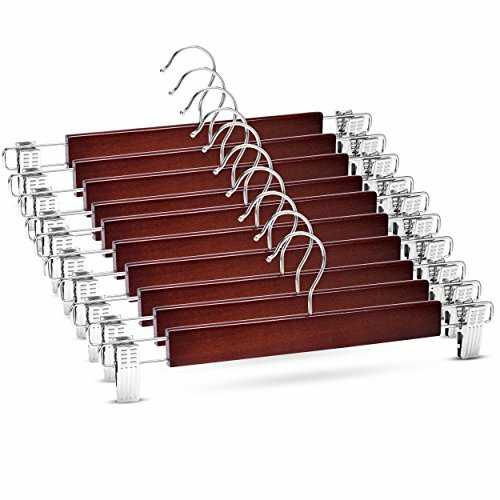 Save 21% on the Zober Premium Wooden Skirt Hangers with Adjustable Clips (Pack of 10) Non-Slip Trouser Hanger Cherry Lotus Wood Pants hangers, 360 Degree Swivel Hook, for Skirts, Jeans, Slacks, Pants, 13'' Wide by ZOBER at Enria Industries. MPN: ZO-W302. Hurry! Limited time offer. Offer valid only while supplies last. Set of premium grade solid wood and metal skirt hangers offer durability and style to your wardrobe; This closet hangers are ideal for skirts and slacks and even heavy jeans. These trouser hangers feature a unique modern design; a smooth, lacquered wooden bar with chrome finish metal ends and pant clips. Pant clips with finger ridges for easy opening and closing as well as interior vinyl tips for grip and cushion against ugly marks. Easily adjust clothes hangers clip widths for different sizes. 360 degree swivel metal hook makes hanging and accessing clothes easy! Trouser hangers durable stainless steel hook is finished in chrome for rust-resistant shine! Jean hangers flat, slim profile take up less space thus de-bulking closets. Wooden hangers dimensions: 13" W x 4" H( 10 pack ).